With the rapid growth of incoming visitors to Japan, amounting to 28.7 million in 2017, as well as the upcoming 2019 Rugby World Cup and 2020 Tokyo Olympics and Paralympics, the number of meetings, corporate meetings and incentive tours is on the rise. The Japan Congress and Convention Bureau (JCCB) has created an event aimed at being the "one-stop platform where meetings and event organizers and suppliers can network and exchange practical information with ease." JCCB and JNTO (Japan National Tourism Organization) will hold the International MICE Expo 2018 at the Keio Plaza Hotel on Wednesday, Feb 28. 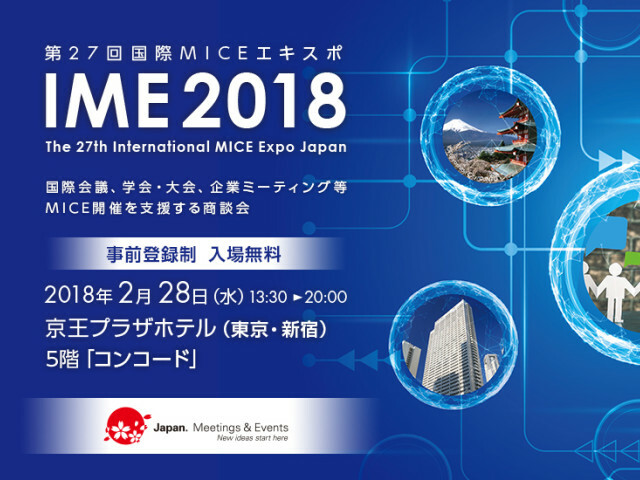 This is the only professional MICE event in Japan that enables search for appropriate venue locations, to find detailed information on support programs and, most importantly, to network with key persons in each region and to conduct business sessions with prior appointment. Date: Feb 28 1:30 p.m. - 8 .m.